One way or another the new year on the Cote d’Azur starts very slowly. Everyone seems busy with New Year get-togethers or parties other than ‘back to daily business aka work”. No one could be reached via email or Whatsapp; I felt like I was on another planet and started to wonder: “Is this still the always bustling international Southern France ? !” Suddenly the penny dropped: many French used the first week of 2017 of course for their new “right to disconnect. That law means nothing to you if you work in a supermarket and just need to fill the counters. Here, strike is the only legal work stoppage. And so it happened; all Carrefour supermarkets will organize in the coming weeks throughout France spontaneous strikes to protest that they need to stay open on Sunday mornings. If you are hit by this strike and you can’t get food; go looking for a tasty quick snack. In most cases, you should need a detour. A recent survey about the number of fast food restaurants such as McDonald’s, Quick and Subway in French cities shows that Nice in terms of fast food is performing badly. In the capital of the Côte d’Azur only 27 fast food joints can be found for roughly 800,000 people, accounting for a thirteenth place. In Bordeaux you can find most fast food restaurants per number of inhabitants. The lover of a triple hamburger is indeed put in the cold, but that’s nothing compared to the cold that refugees have to go through on the Cote d’Azur. The hope of a warm house and a nice benefit without doing anything turned into a feeling of icy reality. It’s in Europe a lot colder than in sunlit Africa that they have left behind. Luckily, people gather around to collect duvets and sleeping bags so that the refugees are at least warm on the street. A typical case of treating the symptoms without addressing the problem. The acquittal this week by the Court of Nice for the Frenchman that smuggled asylum seekers into the country through the hinterland of Menton makes it even more unclear. I understand less and less of politics and decided to take a refreshing ride on the motorbike. While I kept me neatly to the speed on the A8, cars got left and right zigzag overtaken by fellow bikers who apparently have seen too many action movies. Not surprising that the number of fatal accidents has increased by 23% in southern France last year; from 24 to 31. Cause: speeding and too much alcohol. Now motorcyclists were always called driving donors (healthy males), this year the doctors may squeeze their hands. The new Donor Law became effective and makes everyone a donor unless you are registered as dead egoist and keeps your organs healthy for yourself. Actually France as a country is a good subject for a television series about life itself. Which TV producer dares to? The Mayor of Cannes David Lisnard is certainly ready for it; he launched this week the plan to organize a special TV Drama Festival in Cannes to be just as prestigious as the Film Festival. First edition is scheduled in 2018. You do not have to wait that long for some other entertainment; for the coming week, we have two tips for some outgoing events on the Côte d’Azur. Up to date events can of course be found in our free App. 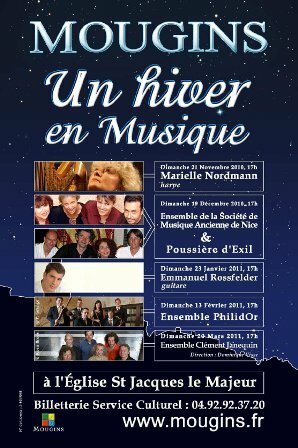 Every Sunday a series of classical concerts at the Eglise Saint-Jacques-le-Majeur in Mougins. Who then reserve a table in one of the restaurants has a wonderful Sunday afternoon and evening. Wedding plans for 2017? 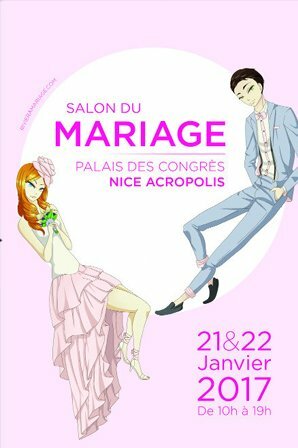 Getting married on the Côte d’Azur is obviously super romantic; this exhibition gives you all the inspiration and puts you in touch with the right suppliers of dresses, locations and cars.